Our school district made a huge change in schedule on us this year. Last year Joey’s school day was from 9-3:30. The afternoons were so short and packed with homework, dinner, and early bedtimes for my sweet kindergartner. This year, school is from 7:45-2! I love our long afternoons. We have time for homework AND playtime! The mornings, however, are tricky to get everyone up and out the door for the school bus at 7:12! 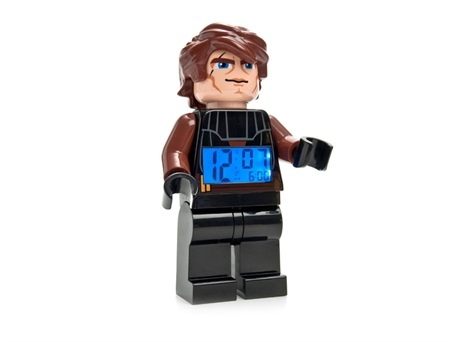 Joey bounces out of bed wide awake each morning when his Anakin Lego mini figure alarm clock sounds at 6. My Abby-girl, however, does not bounce as easily out of bed in the morning. In fact, dragging her out of bed each morning has become more and more difficult. Yesterday, poor Danny fought with her and didn’t have her dressed until 7. So I decided to give her my old cheap-ie alarm clock to use in an attempt to help her be responsible for getting herself out of bed in the mornings. She wasn’t very excited about the “gift” at first, but after we pretended to be asleep and hit the snooze button when it went off, she decided it was big stuff! She proudly showed off her new alarm clock to Grammie and Daddy before bed. So, did it work??? Like a charm! She bounced right out of bed and brought me her alarm to turn off (she can only manage the snooze button) and was dressed with teeth brushed by 6:15!!! Here’s hoping the charm of the alarm clock lasts more than one morning! I think Santa may be bringing her a Littlest Pet Shop alarm clock for Christmas! Instead of an alarm ringing, it meows and barks. Perfect for my sweet girl! Thank you SO much for the encouragement and prayers. My surgery today went pretty well. There was a rough patch when there was an area they were working in which wasn’t numb. It was quickly corrected, but brought out my barely held in tears. Thankfully, it was the greatest team working on me and they kept me talking and distracted. My team of doctors (oncology dermatologist, oncologist surgeon, and the best melanoma oncologist in AZ) talked about my case and they agree that my next step is localized radiation. So I will be meeting with a new member of my team in the next week or two, a radiation oncologist with hopes of beginning radiation on my back as soon as my incisions heal. For the next few days, I will practice taking it easy and following some lifting restrictions. I’m not the best at this, so wish me luck! I am going in tomorrow for removal of tumors on my back. It is pretty clear that this is another Melanoma recurrence. We will need to come up with a new treatment plan in the next few weeks. For now I appreciate prayers for a simple but complete removal tomorrow. God is as good as he was when I was given my cancer free designation 4 weeks ago. We continue to ask Him to guide us in each new step. I read this week that this is the “year of melanoma” and that advances in melanoma are being made “at light speed.” If you’d like to show your support, we’d love for you to come walk with team ¡Mela-no-mas! or contribute to our team. Information is found in the link below. I also would LOVE to know you are praying for me if you are willing to comment. Thanks for loving my family and walking with us through this so often discouraging journey.